I may have mentioned in an earlier post that Kate has worked with PEO on a scholarship program for deserving women. They have concentrated their efforts on women who have been out of school and are now trying to complete their degrees. Most of them are single mothers who are working in low-paying jobs while going to school at night. They also are women who are trying to complete their undergraduate degrees. At any rate, over the past two years Kate has had some difficulty taking care of the various tasks that have fallen to her. In some instances she has simply not acted to send letters or get information that was needed. This year she has been much better at addressing her responsibilities. I think this is a function of her co-chair’s being out of the country during a significant part of the process. Kate really cares about this program and wanted this year’s applicants to get help from the national office of PEO. The issue this year was that she had to devote so much time to write letters of reference and to complete an online form that was required by the sponsoring PEO Chapter C. She wrote, rewrote, and rewrote again the letters until it was almost too late to submit them. However, she received two letters from the national office on Tuesday of this week. I had brought in the mail and sorted out hers and mine. I left hers on the island in the kitchen in an obvious place so that she would notice them. I suspected they might be decision letters on their two applicants and that she would do the same and open them quickly. On Thursday morning when she still had not opened the envelopes, I opened them. Each was a letter announcing that one of the applicants had received an award and inclosing a check. In other words, both of the applicants received awards – 1 for $2,200, the other for $1,500. When Kate got up, I told her I had good news. She was thrilled. She had worked hard and was successful in getting her candidates through the process. Once again, it is a good example of how someone with Alzheimer’s can be both successful and unsuccessful. It is simply hard for her to focus on anything even something as important as this was to her. One of the things that is a continuing issue is the attribution of responsibility for things that happen. This is just as true with Dad as it is with Kate. This deserves a word of explanation. This past Sunday we got back home from taking Brian to New York. A simple experience on the subway illustrates the problem. We used Metrocards. When we were going on our first ride, I went through to show Brian and Kate how to slide the card and walk through the turnstile. Then Brian went through. Kate tried twice, and it didn’t work. I immediately thought she had done something wrong, and the expression on my face obviously showed my displeasure and also said something that that had just cost $7.50 for one ride on a $10.00 Metrocard. Later in the trip I made a mistake by directing us to the subway going the wrong direction which led to our having to exit and come through the turnstiles again. In other words, I had just wasted $7.50 by not being more careful. Experiences like this leave me with a guilty feeling. I know that I should be more understanding because of her Alzheimer’s, but I sometimes act like she can actually help what she is doing. I think I referenced a word that she wished I would never say again – “Remember . . .” Her point was that this reminds her that she can’t remember and I should also remember that she can’t remember. When someone who relates to another person who has dementia he is continuously face with a judgment of how much responsibility to put on the patient. I have been good at assuming that when Kate leaves the gate to the patio open, fails to lock the sliding glass doors from the house to the patio, or puts dishes in the dishwasher in places that seem inappropriate to me, she does these things because of her Alzheimer’s. In other words, I do not attribute responsibility to her and don’t mention these things to her. While I can’t at the moment think of other good examples, there are many of them that come up throughout a typical day. When I got home from visiting Dad tonight, Kate gave me the look that showed she was concerned about my not coming home as early as she had wanted. She did, however, tell me she was glad to see me. We got ready to go out to the spa before having dinner at home when she said, “At least this week, I get to have you all to myself.” Then she very quickly realized that we would have Brian with us. It is another indication of her feeling of insecurity when she doesn’t have me to herself. By the way, I am not bothered by this. I am actually flattered. There are two other indications of where she is with respect to her memory. Last night we received a text from Rachel with pictures of the children at a Missions baseball game. She indicated that this was the second half of the birthday present that we had given to Taylor in April. I showed her the picture as soon as it came through. Tonight she saw the text on her phone and told me about it. She hadn’t remembered my showing her the picture last night. It was something completely new to her. The second thing is that I said something to her the other night and then said, “Don’t you remember . . .” She said, “I wish you wouldn’t say that.” I asked what she meant. She clarified that it was the words, “Don’t you remember.” She doesn’t like to be reminded of what she can’t remember. I apologized and said that I try not to do that, but I slip and would work harder. What is Alzheimer’s like in the early stages? This is a stage when the disease is mostly hidden from other people; however, to someone like me, it seems more obvious. The major problem is day-to-day functioning. For example, Kate has worked for more than a week on a half-page letter of reference for a young woman applying for a PEO scholarship . She has revised and revised it. I signed off on it several days ago, and discovered that she had never sent it and was revising it again. Two months in a row she has forgotten her monthly PEO meeting until someone called the night before. In fact, I just went into the bedroom to wake her up so that she would have plenty of time to get ready for PEO, and she had forgotten about the meeting. Of course, it is likely that she would have remembered it after getting up, but it would also be common for her to have forgotten completely. Two days ago she lost her purse with all her credit cards and ID, and we are scheduled to make a trip to NY on Tuesday. Right now I am assuming we will use her passport as ID. (Note added at 10:03 am. Kate found her purse at 9:30 this morning. It was beside her chair in our bedroom where she often works on her computer. She is quite relieved.) Her personal possessions are continuously being misplaced. She is less able to do the simplest things on the computer. All of these things frustrate her tremendously although we don’t talk about it. We just exchange knowing glances when things happen, and I find myself often giving her a hug. More than ever in our married lives, she feels she really needs me. When I come home from visiting Dad each evening around 6:00, she often looks miffed that I have been gone so long. Then she will often say, “I am glad you are home.” This is not said in any routine way. It is a genuine expression of her insecurity and need for my presence. She also feels she needs me to take care of things for her. She gets along beautifully with friends. They really wouldn’t know unless she asks a question about something they have just talked about. Even that is something that doesn’t normally tip off the person since all of us do that sort of thing occasionally. She can’t follow instructions or any explanation of things nor is she able to give instructions. She will quickly stop me when I start to explain something. With others, she will simply “listen” and not process what they are saying. She frequently asks me to make calls for her, for example, to her doctor’s office to get a prescription refill or almost anything she can pass off to me. Although we live well, we have never lived beyond our means. The exception would be when I was starting my business. We borrowed money to undertake that adventure. We continue not to spend more than we make, but this year has been different. We are spending more, and my intent is to spend even more in the next year. The reason? I feel that we need to do as many things together as we can before time runs out. This coming week we are going to New York with our oldest grandson, Brian. We are doing it up right by staying at the Marriott Marquis, attending the Cirque du Soleil, Spiderman, and Blue Man Group. I have already booked a B&B in New York for a week in December for a special trip that I am considering the first part of our 50th anniversary celebration. On top of that I am going to book a trip to the Galapagos for February or March, 2013. I realize the last entry was on the negative side. In fact, we had just had a great 4th of July together. We didn’t have any plans at all. I got up early, had breakfast, and took an hour’s walk. Then I had a cup of tea and took care of some email. After that Kate wanted some help with trimming some of the shrubs she had a hard time reaching. We worked together for about an hour. Then I took a swim. She finished a short time later, and she got in the pool as well. Following our short swim, we decided to have some leftovers for lunch. I mentioned that Bernie was playing, so we went to the 1:30 movie. When the movie was over, we came home, and I went to visit Dad. We enjoyed the pool and a glass of wine when I returned. This was the first time I felt like being retired would be a good thing. What is early stage of AD like? This is a stage when the disease is mostly hidden from other people; however, to someone like me, it seems more obvious. The major problem is day-to-day functioning. For example, Kate has worked on a half-page letter of reference for a young mother who is a candidate for a PEO scholarship for more than a week. She has revised and revised it. I signed off on it several days ago, and discovered that she had never sent it and was revising it again. Two months in a row she has forgotten her monthly PEO meeting until someone called the night before. In fact, I just went into the bedroom to wake her up so that she would have plenty of time to get ready for PEO, and she had forgotten about the meeting. Of course, it is likely that she would have remembered it after getting up, but it would also be common for her to have forgotten completely. Two days ago she lost her purse with all her credit cards and ID, and we are scheduled to make a trip to NY on Tuesday. Right now I am assuming we will use her passport as ID. (Note added at 10:03 am. Kate found her purse at 9:30 this morning. It was beside her chair in our bedroom where she often works on her computer. She is quite relieved.) Her personal possessions are continuously being misplaced. She is less able to do the simplest things on the computer. All of these things frustrate her tremendously although we don’t talk about it. We just exchange knowing glances when things happen and I find myself often giving her a hug. She gets along beautifully with friends. They really wouldn’t know unless she asks a question about something they have just talked about. Even that is something that doesn’t normally tip the off since all of us do that sort of thing occasionally. Yesterday Andy Griffith died. His passing took both Kate and me back. His show was in its heyday when I was a student at UW in Madison. We always love him and the characters around him. The way I expressed it to Kate he was a “marker” in our lives, one of those people and events that were significant to us. On Tuesday of this week I received a call from an attorney that State Farm has provided for us in a lawsuit against us for an accident that I had coming back from Memphis in March 2009. I am to give my deposition on July 13, and the attorney said that the plaintiff’s attorney had requested that Kate be deposed as well. I said ok somewhat hesitantly. After hanging up, I had 2 concerns. First, is that Kate is uncomfortable being pressed to explain herself. For example, when I ask her how she solved a computer problem, she will usually say, “Don’t ask me” which I take to mean it is stressful for her to try to explain, and she probably is not able to do so. The result is that I try not to press her to explain anything. My earlier comments above acknowledge that I often fail at this. She is quick to tell me when I am pressing her, and then I stop quickly. The second concern is that in her attempt to explain herself, she gets confused and gives inconsistent information. I was afraid that the plaintiff’s attorney would take advantage of this. That led to my talking with Kate about the attorney’s request. 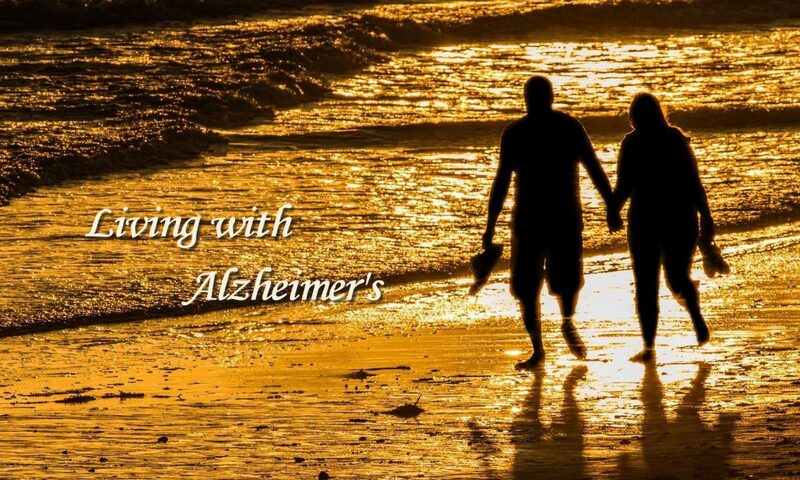 She suggested I tell the attorney about her Alzheimer’s and that we could provide a doctor’s statement if needed. I called the attorney back, and he accepted my suggestion although he did indicate that we may need the doctor’s statement. One question one might ask is, “Is her condition getting noticeably worse?” The answer is it depends on the period of time with which you compare her present condition. I would say she is noticeably worse than she was a year and a half ago when we got the diagnosis. I can’t say that I notice a difference in the past 6 months. What I do see is her working harder to minimize her frustrations. For example, she had agreed to solicit our neighbors for contributions to the Alzheimer’s Association. She hasn’t done it and told me yesterday that she would need my help to get her started or she would never do it. I also interpret her growing interest in tending to her plants relates to the fact they don’t talk back, ask her questions, or provide other frustrations. She is simply able to do what she can. If she does less than she intended, there are no great negative consequences. The only critical thing is to keep everything watered. Yesterday afternoon we arrived back home from Chautauqua. We had a terrific stay at The Spencer and have already reserved the same room for next summer. Kate got along well and enjoyed herself immensely.